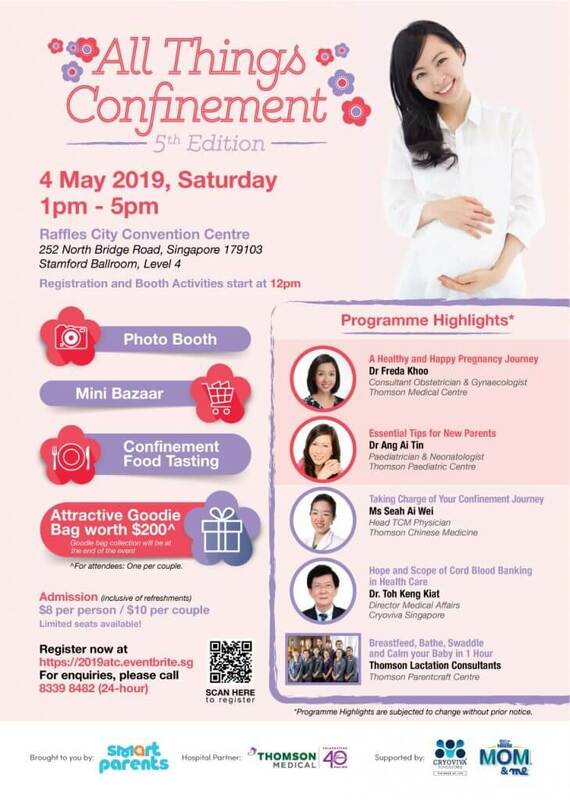 SmartParents proudly presents the 5th edition of All Things Confinement on 4th May 2019 and welcomes all soon-to-be parents to join us for an afternoon of education and interactive activities! Mummies will receive tips from Thomson Medical experts on how to guide you through on being a first time parent during the seminar. From making your delivery decisions to breastfeeding and traditional confinement practices, this seminar provides you with everything you need to know! You will also get to enjoy complimentary confinement food tasting during the seminar. Prepare and navigate your pregnancy journey with the necessary parenting skills and knowledge! Participants will receive a goodie bag worth more than $200! Register with your partner for All Things Confinement for an afternoon of engaging activities and knowledge now!